If you follow my IG page you may have seen this post but I feel compelled to write about this and dedicate a whole post. Some months back, shortly after I publicized my blog and started sharing on my social media, I got a FB request from a young lady from Nigeria. Usually I don’t accept request from people I don’t know or haven’t met but I made an exception for few, one being Nigerians who were in one of the sickle cell groups I follow on FB and this young lady was one… our mutual friends were people in the group, so I figured it’ll be real nice to get to know another Nigerian with SCD, so I accepted her..
Not long after that I sent her message to get her to introduce herself and share her story. 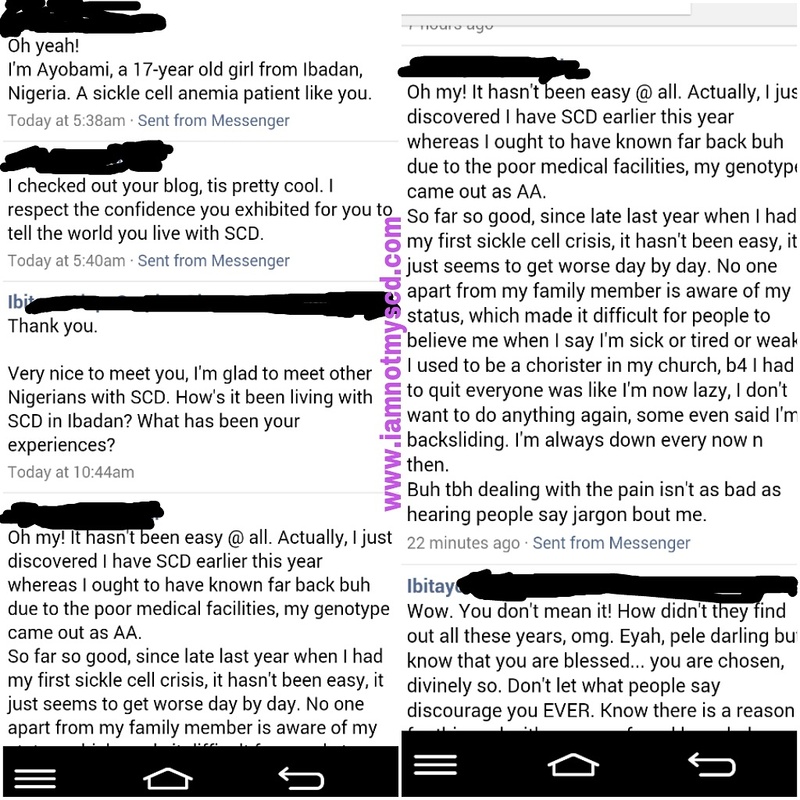 For some reason (obvious one I think), I’m very interested in Nigerians with SCD and love hearing their stories and how they manage their conditions under the circumstances of our country. Is your jaw on the floor like mine was when I read this? Yea. There isn’t enough emoticons to express my shock and I’m sure yours too. So you see why I say we have a big(ger) problem, in 2014? I later found out through research that there isn’t a national policy for newborn screening in Nigeria, first of all that’s a huge problem. That creates a fear within me knowing there are thousands and maybe millions undiagnosed Nigerian, wowzer. Another problem Nigeria faces is the testing capability, how are we suppose to trust the testings done? When errors are being detected every day. There are probably hundreds, maybe thousands like Ayobami that were mistested, that’s scary. We demand this be on a national priority among your already long list. For a country with THE MOST cases of sickle cell disease in THE WORLD, that’s right you read right, the federal government should have initiatives set up that trickles down to state level. Oh wait there is, of course there is, who are these people and why aren’t we holding them accountable? Yes malaria is important, HIV/AIDS are too but so is Sickle Cell Disease, it should be equally important in a country (and continent) that are the most affected. Why is the Nigeria government content with sending a rep to WHO summits and UN gatherings to hear other countries boast and share their initiatives for sickle cell (among other important issues of course). There is no record of Nigeria contributing or actively participating in WHO or UN discussion regarding sickle cell, nothing in documentation in all the internet searches I’ve done. Yet, we’re on everybody’s SCD statistics and WHO’s plans but not one person represents the country on any of the committees, I find that disturbing. When I said we have a bigger problem, boy do we, it’s a long road ahead… this I already know. But it starts somewhere, with someone, we are all that someone. If you know about sickle cell disease and are quiet about it and don’t share the awareness, you are contributing to the problem. I challenge Nigerians everywhere to continue to spread the word to everyone, home and abroad. Let the conversation begin and continue with us, if you want to march, write or call your state reps and government officials, please go right ahead. I know I will.